Uncle Gabby, a sock monkey, takes part in a dual adventure in this color and black-and-white book that offers great fun for both children and adults. Left-hand pages tell one story, while right-hand pages tell another in a completely different style—both together make up a “yarn” sure to keep kids and their parents engrossed. The black-and-white drawings on the left, spare of detail but telling nonetheless, relate Ann-Louise’s dilemma when she realizes that it is David’s birthday and she has no gift for him. Mr. Crow, a toy bird, suggests that she darn David a sock. Ann-Louise considers the yarn and stuffing she finds in a basket at the foot of the staircase, and decides that she will knit a hat instead. She knits too far, though, and instead makes a toy sock monkey. The color illustrations on the right, detailed without being fussy, depict a comfortably elegant old Victorian home with stained-glass windows, abundant woodwork, patterned wallpaper, and carved balusters. Uncle Gabby the sock monkey starts the right-hand side of the book perched on the banister at the top of the house, but slips from his place; a nail catches a strand of yarn from his tail, and as he falls, the yarn unravels until there is nothing left but a clump of stuffing and a miraculously rewound ball of yarn in the basket on the ground floor. These, of course, are the yarn and stuffing that Ann-Louise makes into the sock monkey that she knits for David. Her black-and-white tale concludes with her setting the finished project on the banister post as she knocks on David’s door and runs away. Of course this is precisely the position the sock monkey is in at the beginning of the color illustrations, just before David peers out his door and the monkey loses his balance and topples, unraveling as he goes, down the stairs. Youngsters don’t need a large vocabulary to read this book; in fact, the color illustrations are wordless. The text on the black-and-white pages is simple, and includes a chanting rhyme about the parts that make up a child that kids will enjoy. Ann-Louise is well drawn, as is Mr. Crow. The spare lines of the black-and-white tale advance the story beautifully, as do the color pieces. The author is an Eisner Award-winning artist and illustrator, who has published a whole series of “Sock Monkey” adventures, as well as collections of his gory alternative comic strips, the Maakies. Adults will appreciate the Mobius-strip quality of this story, as well as the Escher-like conundrum of just how the sock monkey comes to be made. 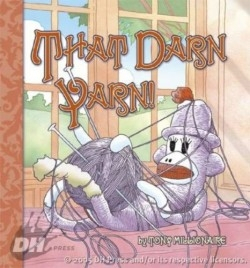 Children will enjoy puzzling over which came first, the monkey or the yarn.